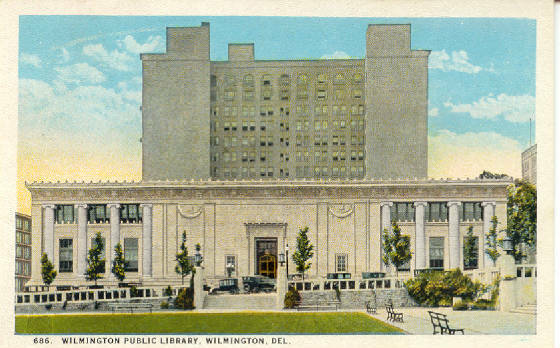 Unlike a New England town with proverbial "village green" of white congregational church, city hall and library, Wilmington, like its Mid-Atlantic sister Philadelphia, features the "square". In Wilmington, Rodney Square -- once site of a reservoir (the other beautiful reservoir is along Franklin Street, next to the refined collegiate Gothic architectural gem that is the superb Ursuline Academy) -- functioned as the "head" of the city. Some have termed this Square the "heart", but I locate that point elsewhere, too. 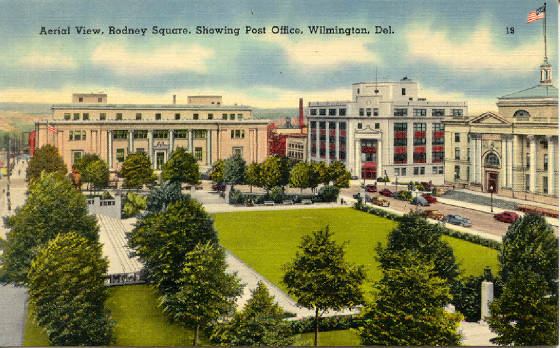 Named for Declaration of Independence signer Cesar Rodney, the Square was a paean to intellect (Public Library), law (Court House), country (Post Office) and commerce (DuPont Hotel and Building). 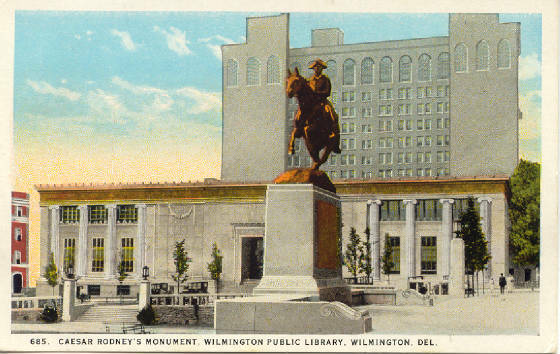 The Public Library, bordering Rodney Square, is the low building on the left. 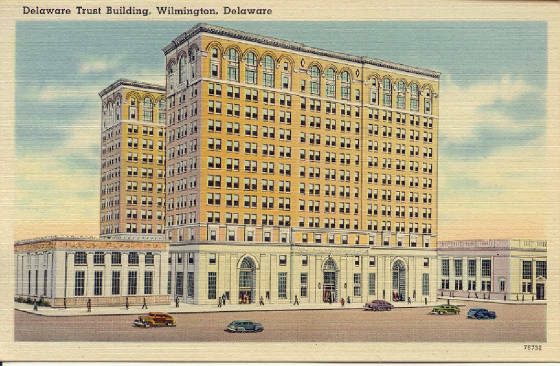 The Delaware Trust Building, completed in 1930 in Classical Revival (a later form of Beaux Arts style), features a brick and Indiana limestone facade. The cornice with arching windows evoked the grandeur of the Renaissance (and of prosperity as well). According to the linen postcard: "Among its nationally known tenants are American Viscose Company, Atlas Powder Company, Barnsdall Oil Company..." This litany comprised a list of names, some of which have gone into oblivion. Four Sides of the Square - This area, which had been a reservoir until 1877, is bounded by four large buildings on Market and King, at 10th and 11th Streets. All took shape in the early decades of the 20th Century soon after the DuPont Company built the DuPont Building for its 500 person staff. 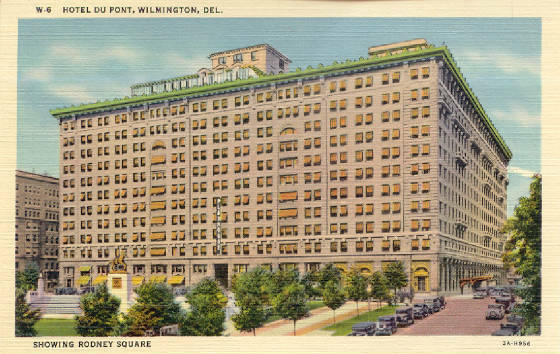 By 1913, DuPont offices, its hotel, and theatre reigned at 10th and Market. Despite the Court House and City Hall's alluring classical revival architecture (seen below, and below right) rendered with impressive granite and columns, I confess myself as one who has never set foot in either building. Perhaps this was an unconscious way of eschewing what historian John A. Munroe referenced as the city's dominance by the bureaucrat that came to be by mid-Twentieth Century. For my family, Rodney Square "bordered" the two sides of the street holding the Hotel DuPont and the Wilmington Public Library. Our memories of coming in from Hockessin to dine -- particularly downstairs in the Grill on the Wednesday before Thanksgiving in the late 1960s when a full turkey dinner was featured, and later in the 1970s at the various Hotel duPont restaurants (there was even a kind of discotheque in the Grill on Saturday evenings in the early 1970s) -- and of using the old-fashioned library (prior to the renovation that took place in the 1970s and the situation of branches out on Kirkwood and Concord Highways) -- are the dearer ones. As for local politics and "court business", these never engaged a family whose interests were in other places and continually moving outward to other regions of the country where we lived over time-- Tulsa, Miami, Chicago, Boston, for one branch, and Washington, D.C. and Houston, where my parents eventually moved after my father had spent most of his 70-some years in Delaware. 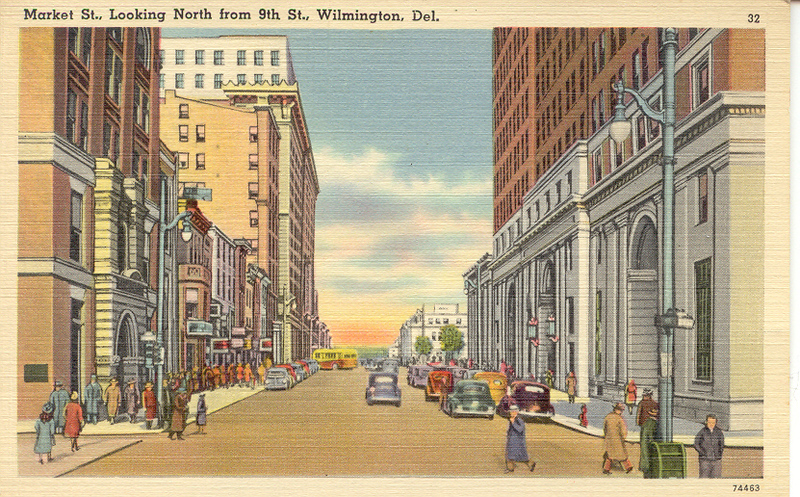 It was a surprise for me, living briefly again in Wilmington in the early 1990s, to discover a world a lawyers living in the environs of Delaware Avenue! 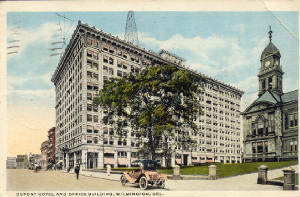 Philadelphia firm Irwin and Leighton constructed the building, dedicated in 1914 and opened in 1916. On land donated by Pierre S. DuPont, New York architect Edward Lippincott Tilton (1861-1933), formerly of McKim, Mead and White and responsible for 60 library buildings, designed this elegant -- and garlanded -Beaux Arts' structure (below) for the Wilmington Institute Free Library that was finished by 1922.Behind the library looms the massive Delaware Trust Building. Classically-columned symmetry evokes the life of the mind. Nothing was more pleasurable than visiting the downstairs children's library in mid-century and reading the Litte Maid Series. Who knows if these volumes are still extant in the collection, or have been sold at used-book tombolas? This singular symbol of Delaware was dedicated on Independence Day. 1923. 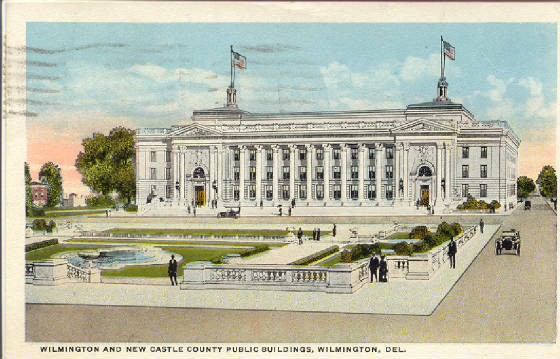 Before the completion of all four sides of Rodney Square, the populace relied on the New Castle County Court House that can be seen to the right of the DuPont Building, along Market Street. 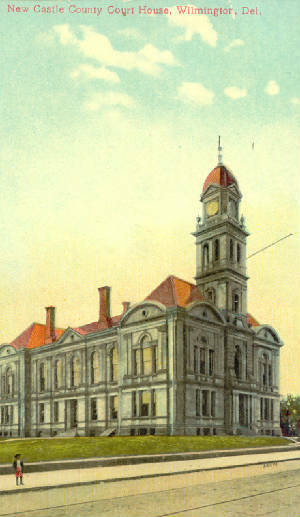 By 1890. the Courthouse had been relocated from New Castle onto Rodney Square, once site of a reservoir. Again, a public building designed in Richardsonian Romanesque, a late 19th Century style. 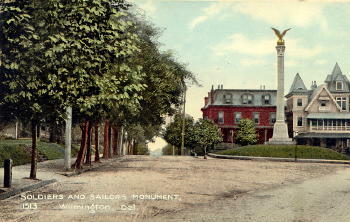 This old courthouse stood on what is now Rodney Square. CARD POSTED IN 1910 READS "THIS IS A FINE CARD FOR YOUR COLLECTING." 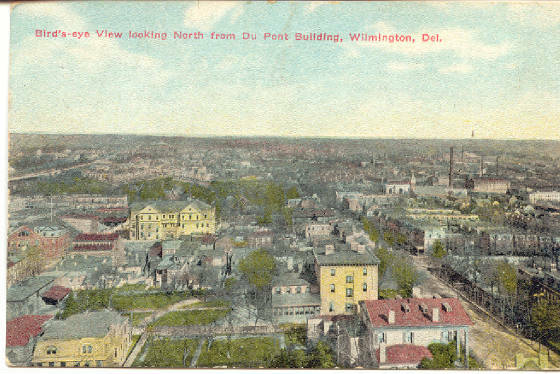 Once the Trolley Line was linked with lower Delaware Avenue in the later years of the Nineteenth Century, Wilmington's substantial bourgeoisie constructed their Queen Anne and French Empire-style houses here. This is the neighborhood I consider the "heart of Wilmington" -- where its ghosts and spirits linger, and where I was priveleged to live for a period in the last century. It is where Wilmington's Mayor lived and Howard Pyle painted and where Mrs. Tatnall began her school while the dedicated Ursuline Nuns gathered to teach at their Academy on Pennsylvania and Franklin. The Interstate-95 construction in the late 1960's and early 1970's left an irreparable loss along Delaware Avenue and near Cool Springs, too, devastating urban pockets that were once full of charm and grace, and destroying whole blocks of Victorian neighborhoods in order to protect far-flung suburban holdings whose residents, though outwardly affluent, had no conception of preservation, or even of their past. This is the legacy of a narrow and aesthetically uneducated mindset that, in the immortal words of Oscar Wilde, "knows the price of everything, but the value of nothing." Even now, decades later, this loss is palpable to the city wanderer. Or perhaps it is but part of nostalgia, the larger regret one suffers living forever at remove from a beloved place, and left only clutching postcards from the past. . .